Blue Ridge Area Food Bank serves 25 counties and 8 cities on either side of the Blue Ridge through 4 distribution centers, Lynchburg being one of them. 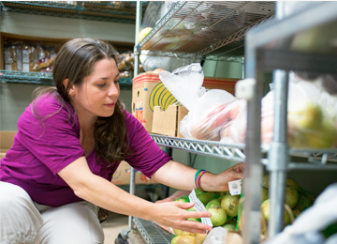 As a whole they provide nutritious food to 105,100 people each month through a far-reaching network of 212 food pantries, soup kitchens, schools, churches and other nonprofit groups. QMPC is involved through financial support, volunteers, canned food drives and also regular fresh produce from the QMPC community garden.